As you know, I recently ordered a few teas from Plum Deluxe. Another tea in this order was Strawberry Orange Herbal Tea. This tea is actually from their “blooper” section and is offered at a sale price. The reason it is a blooper is because a large customer ordered a special blend and then didn’t end up purchasing the blend. Their loss is my gain! 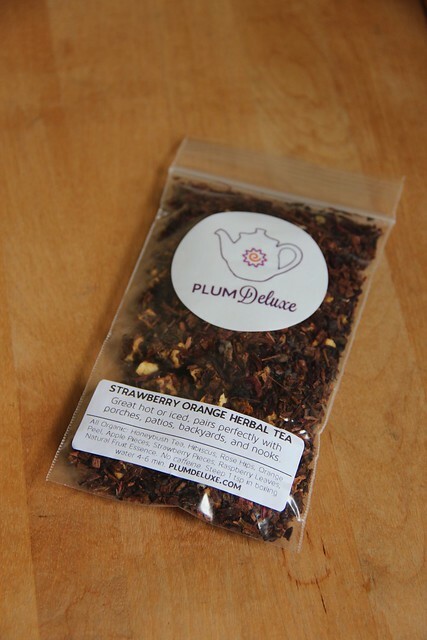 From the label, Strawberry Orange Herbal contains honeybush tea, hibiscus, rose hips, orange peel, apple pieces, strawberry pieces and raspberry leaves. Strawberry Orange Herbal is available in limited quantities for $3.50 an ounce. When I first opened the package I could smell the strawberry and the apple most strongly. Once brewed I got more of the hibiscus scent, along with the berry and orange flavors. I did add just a touch of sugar, but this one is fruity and sweet enough I’m sure I could have gone without. This was excellent both hot and cold – just a fruity, refreshing summer drink. If it sound good hurry or you may miss it! 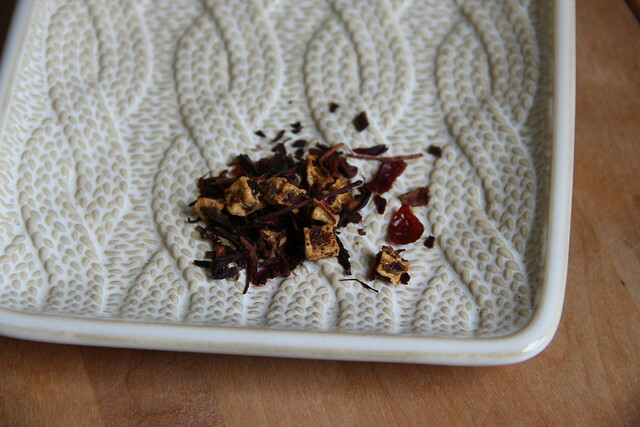 Next The Corner of Knit & Tea: Episode 93, It’s getting hot out here.